Many trends evolved during the twelve months of 2004, moving from being new, interesting ideas to becoming part of our industry’s infrastructure. The SD Times 100 is our attempt to recognize the players behind those trends. Each year, we seek to identify the movers and shakers. 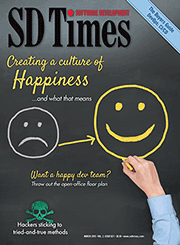 Not merely the biggest of the big (though such companies are nearly always influential), the companies and organizations cited in the SD Times 100 are those that we believe demonstrated the greatest amount of leadership, either through market clout or meaningful technological innovation. The word “meaningful” is important: A clever new tool or interesting paradigm isn’t enough to demonstrate leadership. To lead, others must follow. We define the SD Times 100 as being those organizations, individuals or movements that were talked about, those that created not only great technology but also great buzz. Our choice was controversial. Many readers felt that by recognizing SCO, we were endorsing the company’s initiatives. But we stand behind our recognition of SCO, because the company set off a firestorm of debate within the entire IT industry, minor aftershocks of which are still being felt today. If that doesn’t define influence, nothing does. Of course, fame may be fleeting. You won’t find SCO listed among this year’s SD Times 100 companies. Why? Even though the courts haven’t yet ruled on the legal case, the software development community has voted the company, and its tactics, off the island. Open-source software is stronger now than it was before SCO began its assaults; look at the tremendous success of Eclipse and JBoss, for example, Sun’s initiatives around OpenSolaris, and the re-emergence of Novell as serious player. In other words, the FUD flopped.